It is always good to remaster the methods of the past and to do it practically so that we can recognize the natural skills in place when excavating. It appears similar structures appear on both sides of the Atlantic and may denote sharing particularly between 2400 BC through 1159 BC. However primitive wood systems only allow so many options anyway. Boggy or wicking soils demand a floor covering able to leave moisture behind and basketry will do that. I have been blogging about the archaeology of structures for nearly 7 years, during which Google tells me I have a little over half a million page views; some of this self-selecting audience get in touch and we take things further. 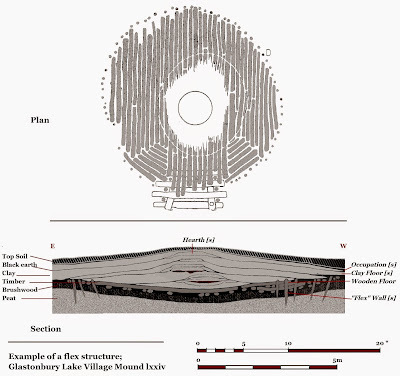 One such was Bill Kennedy; we share an interest in modelling archaeological structures from their foundations, only he builds full scale Prehistoric Native American structures at Sun Watch nr. Dayton, while I like mine to fit on my drawing board or hard disc. So, at Bill’s instigation, we have written a chapter together in Building the Past: Prehistoric Wooden Post Architecture in the Ohio Valley–Great Lakes, recently published by University of Florida. [And they forgot to add to over an inch thick- it's great value at $84.95]. Ours is the final chapter which discusses how the archaeology reflects the mechanics of different types of structure, covering the sort of basics discussed in earlier posts. [here]. Apart from being privileged to able to contribute to some decent archaeology, it is very useful to able to think about the cultural bias in my own methodology which has been derived from the study of Eurasian timber architecture. While any attempt to create structures will be conditioned by the general properties of materials, and gravity, beyond this, the rest is technology, dependent on the knowledge of individuals within a culture. While they may share some Mesolithic commonality, and sporadic contact, for most purposes America and Eurasia were culturally unconnected, and furthermore, were building for different types of society in their own particular environment. One distinctive feature building in Ohio is to use thin flexible stems to weave a structure, effectively creating an oversized inverted basket. The remains of the small buildings from Glastonbury Lake Village are examples of this “flex” technological approach, although in British archaeology, shape is generally the primary consideration, with little or no concern for technology, form, function, materials, or scale in the analysis of structures. This lowest common denominator comparative approach to timber architecture, based on shape, in is marked contrast to the use of measurement, empiricism, and deductive reasoning used in American archaeology. From a modelling point of view these “flex” structures involve curves rather than straight lines and represent entirely different approach from rigid post and lintel framing, although the two techniques can be combined. I was particularly intrigued by some of the larger buildings with ridged frames, and I hope to publish something on the blog about a 3D structural model for the Hopewell building at Edwin Harness. As noted, working on reverse engineering structures for different systems is useful in differentiating assumptions which reflect cultural bias from those that might be considered universal deriving from the properties and mechanics of our environment, beyond this there is no mutual benefit. The Study of Native American buildings really teaches us nothing about the Neolithic European tradition and visa-versa. To look at building in any other way would be to assume that, left to their own devices; the Native Americans would have in time developed their own railway system. All this started because I wanted to teach students how to understand buildings and structures more systematically from the sort of evidence they would encounter working in the field. By and large these are things that I had not been taught as a student, but had been gleaned subsequently from 20 years of study. However, precisely because it was new research, and not what is taught, it was doomed to failure at an institutions like Newcastle, where in common with other university in Britain, a post-processual approach has encouraged the study of things archaeologists don’t actually find. As a result, many teachers can only understand archaeology once it has been written down, much to the detriment of their students, future fieldwork and deductive reasoning in general. It is important for an archaeologist to be able to understand archaeological evidence in the raw, in a hole in the ground, when it has not yet been written down; it is this process of converting dirt into words that lies at the base of the academic food chain. However, real field archaeology is the un-calibrated instrument erratically picking impressions of the past, and unless those that teach are fully engaged and competent in the process which feeds information into a system, the basic principle of garbage in garbage out will compromise the rational integrity of the subject. Initially, I had only ever intended TSA it as a tool for understanding the complexities of British palimpsest archaeology, that some of it has eventually found a home at last on the other side of the Atlantic is an unexpected bonus. The chapters that comprise Building the Past: Prehistoric Wooden Post Architecture in the Ohio Valley–Great Lakes is a testament to potential of meticulous excavation combined with detailed and intensive evidence based study, as well as what can be achieved by collective effort and cooperation. Understanding the evidence for structures should not the preserve of illustrators, experimental archaeologists, or academics, it should be to part of the process of excavation and reporting or the opportunity will be missed; once the archaeology is written down it is doomed to be repeated.